Fancy hi-tech gear review: the Brompton Basket. I like it. Even in describing only the material components of technics, this practice overlooks the equally vital role of containers: first hearths, pits, traps, cordage; later, baskets, bins, byres, houses, to say nothing of still later collective containers like reservoirs, canals, cities. These static components play an important part in every technology, not least in our own day, with its high-tension transformers, its giant chemical retorts, its atomic reactors. I’ve tried my share of containers for the Brompton and I think the basket has its place. Particularly, it’s a heck of a lot easier than rooting around inside the touring bag and notably more compact than the S bag (unless you jam the basket full of stuff). Both of these benefits derive from the basket’s open top–the basket is easy to use because you can chuck a bunch of stuff in it easily. This advantage is also the basket’s Achilles heel–too much stuff and a bounce (particularly prevalent for small wheels + bad roads) and the basket will return your belongings. 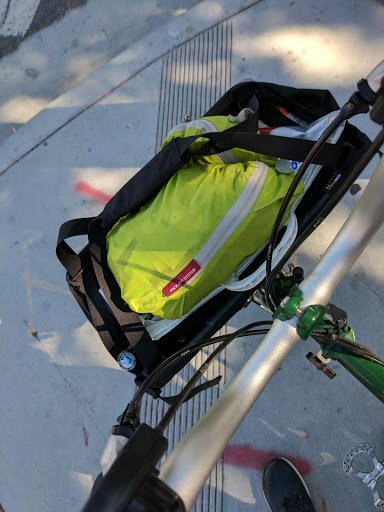 I think the single zipper pocket (for putting away my keys, phone, and other small items) plus tensioning the straps properly (and not overloading the basket) adequately offset the bounce-out danger. Looping back to Mumford, this and other containers play a vital role in my utility bicycling. That being said, if one reads Mumford beyond the quote it is clear that the point of his essay is to think beyond mere utility (“Our age has not yet overcome the peculiar utilitarian bias that regards technical invention as primary and aesthetic expression as secondary or superfluous”). Without reconsidering the whole concept of “Utility”/”Practical” biking (what an interesting post idea), I do take a moment to reflect on the aesthetics of the Basket. The Basket is minimalist–matte black with some reflective accents. It is not particularly stylish but gets out of the way in the literal and visual sense. The only story it has to tell is that of its contents, that of a faithful container–on weekdays holding my lock, repair kit, occasional change of clothes, work computer, and phone charger and on weekends swapping roles for any number of other items or even nested bags when it carries my wife’s purse. In short, the Basket lives many lives but does not wear them on its sleeve. Its empty abundance subtly invites adventure. Its statement is a non-statement and that statement is my last on the matter.